1985 saw the series return to its traditional Saturday evening slot, with just one episode broadcast each week as opposed to the two episodes that had been broadcast in the previous three seasons. There were a couple of changes though. Most importantly, the number of episodes was cut from 26 to just 13. However the length of the episodes was increased from 25 minutes to 50. So in terms of actual screen time, viewers weren't really missing out. The Sixth Doctor's first season is so full of classic monsters and returning characters that you'd be forgiven for thinking that this was an anniversary year. Or perhaps John Nathan-Turner feared that this might be the final season of the series and was using everything he could think of think to get people watching. Whatever the reason, this season is bookended by the series' two most famous monsters - the Cybermen and the Daleks, we get the return of an old Doctor and companion, yet another meeting with the Master and the introduction of two new villains, both of whom would return in the future. The first story broadcast of this exciting season was 'Attack of the Cybermen'. This story was intended as a sequel of sorts to the Cybermen's debut, 'The Tenth Planet', as well as Second Doctor story 'Tomb of the Cybermen'. The story is reasonably straightforward although at the time it was criticised for including a large number of references to the series' past. 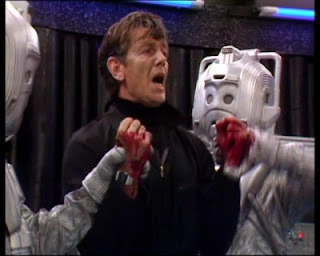 Cybermen from the future have captured a time machine and travelled from their adopted world of Telos (seen in 'Tomb of the Cybermen') to Earth in 1985 in order to prevent their original home world of Mondas from being destroyed. (as depicted in 'The Tenth Planet'). The Doctor, needless to say, stops them. As well as the references to the two Cybermen stories mentioned above - neither of which had been repeated - there were also references to 'An Unearthly Child' (the TARDIS lands in the junkyard at Totters Lane for no particular reason) and to 'Resurrection of the Daleks' from the previous season. 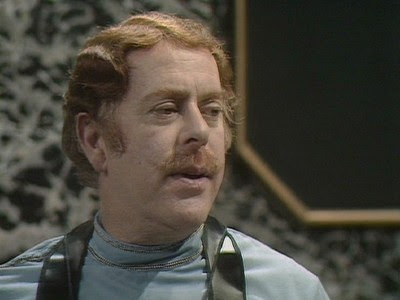 Lytton, the mercenary character who was working for the Daleks in that story, reappears here and everyone assumes that he's working now for the Cybermen. However things aren't quite what they seem and, in the end Lytton dies while helping to defeat the Cybermen, causing the Doctor to reflect that he might have mis-judged Lytton. If all of this weren't enough we also have a subplot that sees the Doctor trying to fix the chameleon circuit on the TARDIS - and succeeding! Sort of. Instead of the familiar police box shape, the TARDIS in this story becomes, at various points, a old stove, a pipe organ and a pair of ornate iron gates. By the end of the story, though, the circuit is broken again and the TARDIS is back to its usual shape. The next story, 'Vengance on Varos', is somewhat ahead of its time as it tackles the subject of reality TV taken to extremes. The people of Varos are poor and hungry and kept in check by something called the Punishment Dome. Anyone who rebels against the government is thrown into the Dome to suffer and eventually die with the whole thing being screened on TV to the rest of the populace. The Doctor and Peri arrive on Varos and, not surprisingly, end up in the Punishment Dome with Sean Connery's son. They manage to escape and uncover one of the main cause's on Varo's poverty - a slimy slug-like creature called Sil. Sil is a great character, wonderfully brought to life by actor Nabil Shaban. He's not really evil just amoral. He's also a businessman rather than sort of insane megalomaniac that most Doctor Who villians are (see the very next story for proof of this). Sil's mining company have consistently underpaid the Varosian government for a rare mineral, causing many of the planets current problems. The Doctor helps the current Governor of Varos (played by King of Radio 4, Martin Jarvis) to turn the tables on Sil. 'Mark of the Rani' is up next, taking us back to the Industrial Revolution and a meeting with George Stephenson. The story also sees the return of the Master, looking surprisingly well after being miniaturised and then burnt to a crisp in last season's 'Planet of Fire'. The Master wants to exploit the Industrial Revolution and use it to take control of the Earth. The Master isn't the only other Time Lord on Earth, however. As well as the Doctor he also has to contend with the Rani, a female Time Lord who is on Earth conducting experiments on some miners. Like Sil, the Rani isn't really evil as such. She's certainly not in the same league as the Master. The Rani is a scientist and is only interested in her experiments. The problem is that she doesn't care about the effect that those experiments have on those around her. For instance her experiments on the miners cause them to go crazy and start smashing machinery for no good reason. The Rani also has no time for either the Doctor or the Master nor their petty feud with one another. In fact, she's quite happy to set the two of them at each other's throats while she gets on with her own work. 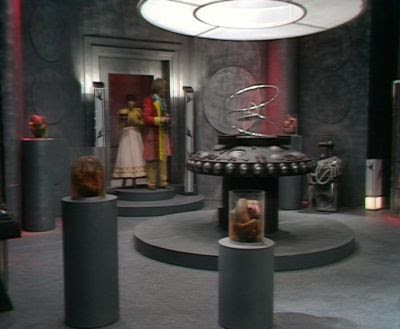 The Rani also has one of the most impressive TARDIS console rooms ever seen in the series. At the end of the story she and the Master are trapped in her TARDIS being plagued by a Tyrannosaurus Rex (and if you want to know why, buy the DVD). From two villainous Time Lords to 'The Two Doctors'. 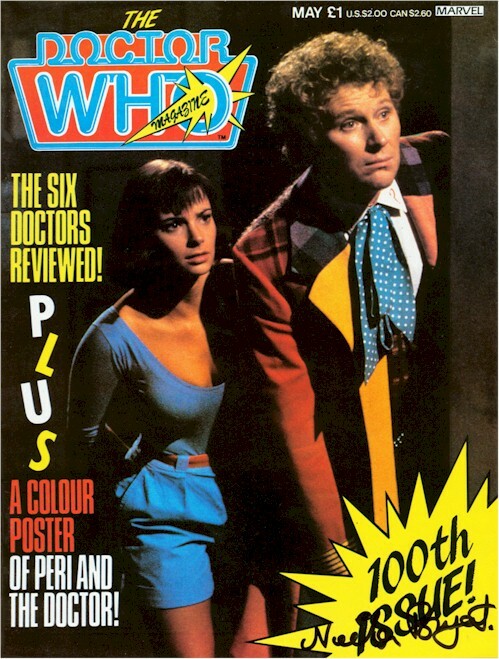 The Second Doctor and Jamie return and meet up with the Sixth Doctor and Peri in the first multi-Doctor story that isn't an anniversary special. This story sees the Sixth Doctor and Peri travelling to Spain in the 1980s to aid the Second Doctor who has kidnapped by the Sontarans and their new allies, the food-obsessed Androgums. 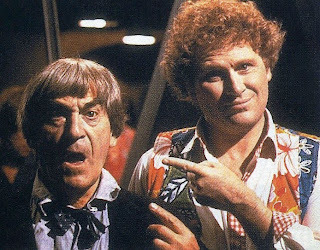 In retrospect it's a bit of a shame that the two Doctors don't spend a great deal of time together, as this was to be Patrick Troughton's last appearance in the series. 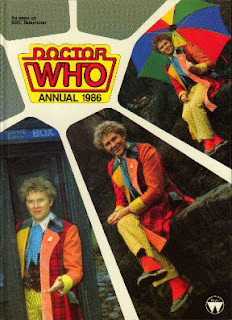 As it is, the Sixth Doctor spends much of the story looking for his earlier self. The few scenes they do spend together though are a lot of fun. At this point I should mention 'A Fix with Sontarans'. For those who don't know, this was a short scene specially filmed and shown during an edition of a (now sadly infamous) TV show called 'Jim'll Fix It'. 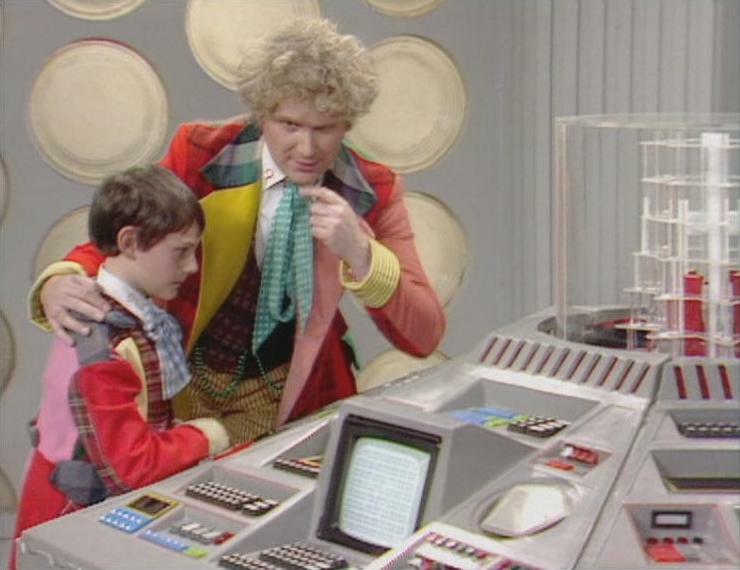 One young boy called Gareth Jenkins wrote into this programme and said that he would love to play the Doctor in his own special Doctor Who story. 'A Fix with Sontarans' was the result. 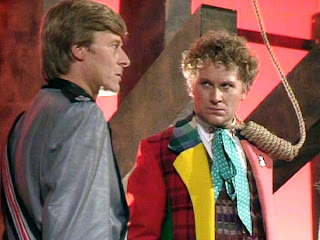 It was shown after episode 2 of 'The Two Doctors' and featured the Sixth Doctor, Tegan (Nicola Bryant was unavailable) and young Gareth (in a home-made Sixth Doctor costume) taking on two Sontarans, played by the same actors who played them in 'The Two Doctors'. Sadly, thanks to the unsavoury actions of its presenter, 'Jim'll is a programme that most people prefer to forget. But this scene is rather nice and worth checking out if you can find it. 'Timelash' is the penultimate story of the season and it's a story that is somewhat unpopular amongst many fans. I think it's telling that even the Doctor Who official You Tube page, which has uploaded clips from every Sixth Doctor story, couldn't be bothered to include anything for Timelash. In this story, the Doctor and Peri visit the planet Karfel which is under the control of a creature called the Borad and where those who rebel are sentenced to the Timelash. The Timelash sends people down a time corridor to hideous end. Or, as it turns out, nineteenth century Scotland. There are a couple of things worth watching this story for. 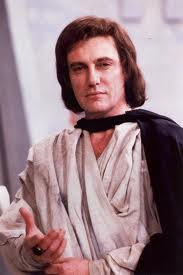 One is Paul Darrow - the second former Blake's Seben cast member in as many stories. 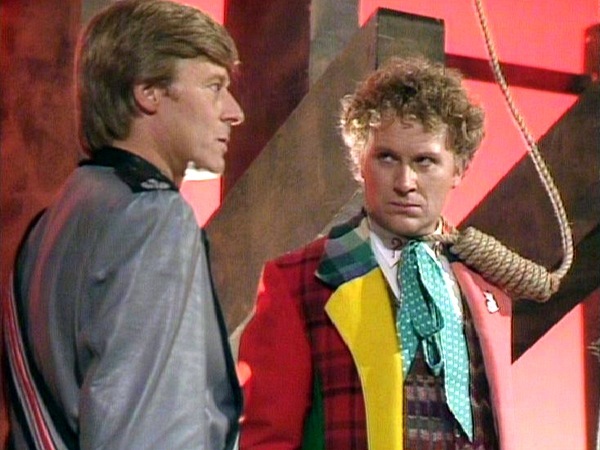 Darrow played lead chracter Avon in Blake's 7 and Colin Baker was a guest in an episode of 'Blake's 7' back in 1980, playing a leather-clad psychopath called Bayban the Butcher. Baker's performance in that episode was not exactly what you might call subtle. Allegedly, when Paul Darrow was cast in 'Timelash', he decided to give a somewhat over the top performance of his own as a way of getting some payback for Baker's OTT performance on 'Blake's 7'. Whatever the reason, Darrow's performance in 'Timelash' is certainly worth watching. Also worth looking out for is the character of Hubert, whom the Doctor meets in nineteenth century Scotland when he travels down the Timelash. Hubert is a writer and he travels back to Karfel with the Doctor and helps to defeat the Borad. We don't learn Hubert's full name until the end of the story but given the he's travelled in a time machine and helped to stop a war of the worlds, it probably doesn't take a genius to work out that his name is H G Wells and that his adventure with the Doctor is the inspiration for some of his most famous novels. As promised, the season is rounded out by Daleks, specifically 'Revelation of the Daleks'. 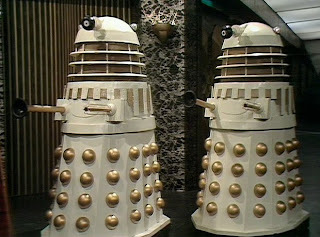 In actual fact the Daleks stay very much in the background here, it's Davros who takes centre stage. He's set himself up on the planet Necros as the Great Healer, the controller of Tranquil Repose, a funeral home for the very best in the galaxy. 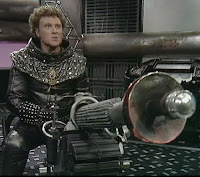 What few people realise is that Davros is experimenting on the dead bodies and changing them into a new breed of Daleks. The Doctor teams with a mercenary (yes, another one) to stop Davros and then some other Daleks turn up and arrest Davros for crimes against Dalek-kind. 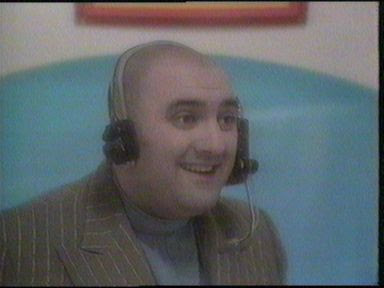 Things to look out for here are guest appearances from Alexi Sayle as a DJ and Clive Swift, who in a few years time would go on to play Richard Bucket (pronounced 'Bouquet') in Keeping Up Appearances. Also look out for the moment where Davros gets his hand shot off. In a nice bit of continuity, when Davros appears in the 2008 episodes 'The Stolen Earth' and 'Journey's End' he has a new robotic hand as a replacement. As the season ends the Doctor promises Peri a holiday. But just as he's about to reveal the location the screen freezes and we launch into the end titles. There was a reason for this. The Doctor was to say 'Blackpool' which would have led into the opening story of the next season that would indeed have been set in Blackpool. However, BBC 1 Controller Michael Grade had decided that the series needed a rest and put the series on 'hiatus'. With no idea when the next series would air, plans for the next season were scrapped and the word 'Blackpool' was erased. On video, classic Tom Baker story 'Pyramids of Mars', Second Doctor and Ice Warriors adventure 'The Seeds of Death' and Anniversary special The Five Doctors were all released. In addition, the series of Myth Makers interview tapes continued with tapes featuring interviews with Nicholas Courtney (the Brigiadier), Carole Ann Ford (Susan), Janet Fielding (Tegan) and Nicola Bryant (Peri). With the programme being placed on hiatus and possibly facing the threat of cancellation, a group of fans decided to do something about it. Seemingly inspired by Band Aid, a group of minor 80s pop stars and Doctor Who actors (including Colin Baker and Nicola Bryant) were brought together to record a song called 'Doctor in Distress'. The song was a potted history of the series as well as a call for it to return. It is completely awful. The BBC refused to play it because of its poor quality and even it's co-writer and producer, Ian Levine, would later admit that it was terrible. Fortunately, there were some good things to come from Doctor Who's enforced absence from TV. One of those things was 'Slipback', a radio drama starring Colin Baker and Nicola Bryant. It was broadcast on Radio 4 in six 10-minute episodes during the Summer of 1985. 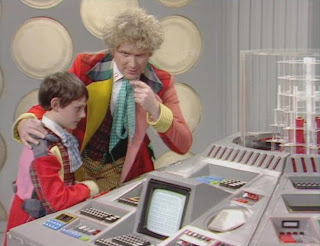 The story sees the Doctor and Peri arrive on board a spaceship where the ship's computer has a split personality that endangers everyone on board. It's main guest star is Valentine Dyall (formerly the Black Guardian) who plays the ship's captain. This was his last acting performance as he died in June 1985, shortly after recording the play and a month before it was aired on the radio. Also, in 1985,Doctor Who the Music Volume II was released. A sequel to 'The Music, released in 1983, this album included incidental music from the 1983 and 1984 TV stories. The ongoing series of novelisations continued with books for 5 out of the 6 Doctors. 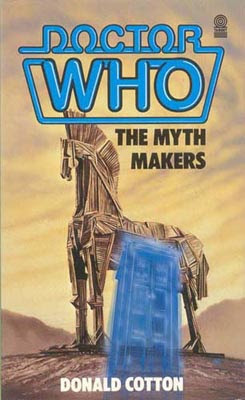 For the first Doctor, we had novelisations of two historicals: Marco Polo and The Myth Makers, both written by their original authors, John Lucarotti and Donald Cotton respectively. Cotton's book is particularly noteworthy as it's the first book since 'The Daleks' to be written entirely in the first person. It's narrated by Homer (the Greek poet not the Simpson) and it's also incredibly funny. Second Doctor fans were treated to novelisations of The Invasion by Ian Marter and The Krotons by Terrance Dicks. 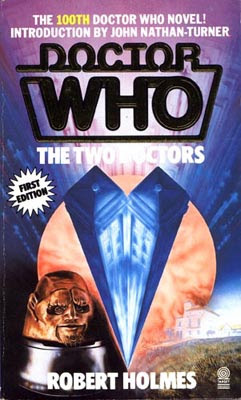 Dicks also novelised Third Doctor story The Mind of Evil and the final Fifth Doctor story, Caves of Androzani. 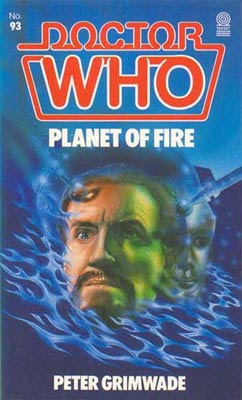 The other Fifth Doctor stories novelised this year were Planet of Fire and The Awakening. Again both were written by the authors of the original TV stories, Peter Grimwade and Eric Pringle. While on the subject of fiction, I should mention a unofficial novel written by Jean Airey called 'The Doctor and the Enterprise'. This is, in case you didn't guess, a crossover between Doctor Who and Star Trek and sees the Fourth Doctor encountering Kirk, Spock et al. The Doctor Who Role-Playing Game was released in 1985. Or rather, the first attempt at a Doctor Who roleplaying game as there will be several over the years. Various game books were released to tie in with this. There were a number of non-fiction books published this year. There was a quiz book, the Doctor Who Cookbook (including various Doctor Who themed recipes), as well as a Book of Science and a Book of Space. 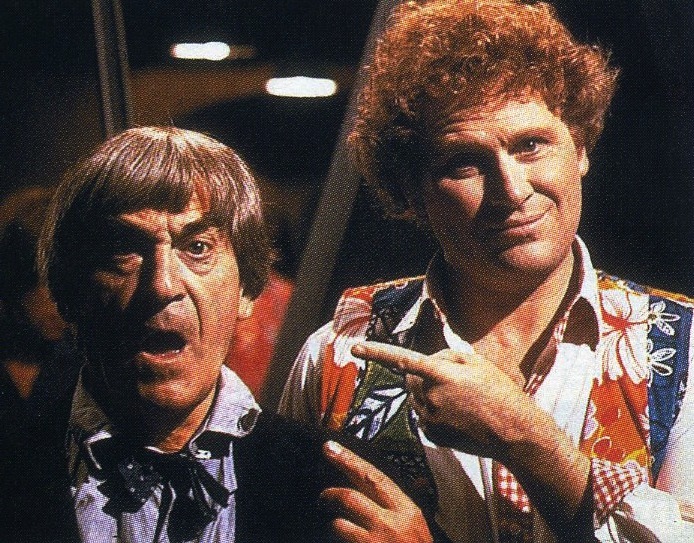 The TARDIS Inside Out was written by John Nathan Turner and gave an overview of each of the Doctors, the actors who played them and the making of the series. Nathan-Turner, having worked on the series in one role or another for many years included a number of his own personal anecdotes on making the programme. Also published this year was 'Timeview'. This book focused on the artwork of Frank Bellamy. Bellamy, amongst many other things, produced a lot of Doctor Who related artwork for the Radio Times during the 1970s. His artwork was collected in this book with comments from his son, David. And yes, that was David Bellamy, the famous botanist with the big beard who was on TV a lot during the 1980s. Finally, we have the end of an era - at least for a while. The final Doctor Who Annual was published this year, bringing a two decade tradition to an end. 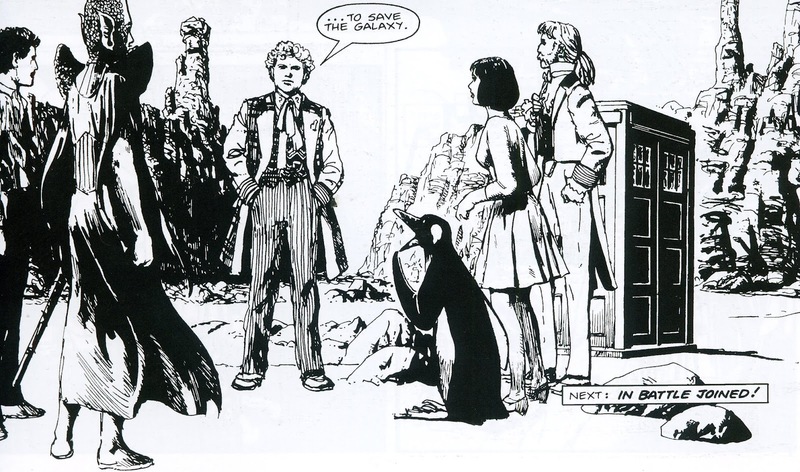 The year began with the final part of 'Polly the Glot' in the Doctor Who Magazine comic strip. Previously in this story,we had discovered that the mad Time Lord Astrolabus was the President of the Save the Zyglot Foundation, a organisation that the Doctor was trying to help. In this final part it emerges that Astrolabus is also controlling the people who are capturing the Zyglots in the first place. Why? That's not made entirely clear. Perhaps it's just to attract the Doctor's attention. Whatever the reason, when the Doctor and Frobisher confront him, Astrolabus kidnaps Frobisher and jumps into a 'magical cabinet'. The Doctor takes off in hot pursuit leading into the next story, 'Once Upon a Time Lord'. 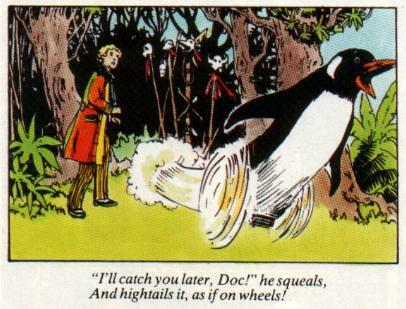 In this story, the Doctor tracks Frobisher down to a strange land where storybook characters seem to come to life. It's very similar to the Land of Fiction seen on TV in 1968's 'The Mind Robber' although it's not, as far as I can tell supposed to be the same place. One thing I do like about this story is that it makes good use of the medium that it's published in. Several pages for example are in the style of children's comics from the early 20th Century - using rhyming captions beneath the illustrations. Having finally caught up Astrolabus, the Doctor discovers that the star charts that Voyager had ordered him to find (in last year's 'Voyager' strip you may remember) are actually tattooed all over Astrolabus's body. With the star charts found, Voyager himself arrives, kills Astrolabus and sets the Doctor free. The conclusion of 'Once Upon a Time Lord' also marks the end of Steve Parkhouse's time as writer of the Doctor Who comic strip. After four years as writer and many acclaimed stories to his name, Parkhouse was going to difficult to follow. Fortunately his replacement, Alan Mackenzie seemed to be up to the task. 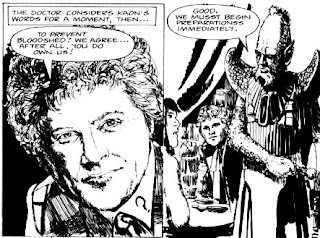 The 100th issue of Doctor Who Magazine included the first part of the first Mackenzie-written comic strip story, 'War-Game'. 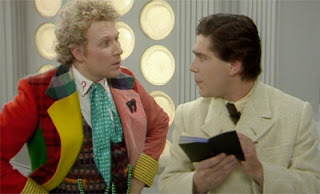 In this story, the Doctor and Frobisher land on a primitive world and make the acquaitance of an elderly Draconian called Kaon who crash landed on the planet. They help him to rescue his daughter who has been kidnapped by a barbarian lord but Kaon is killed in the process. The next story, 'Fun House' sees the TARDIS land inside what appears to be a living house that feeds off emotions. After trying to scare the Doctor and Frobisher with illusions, the House then tries to use the TARDIS to turn itself into a time machine. The Doctor manages to turn back time and the TARDIS escapes the house. This story sees the first appearance of Peri in the strip (and, indeed, the first appearance of any TV companion in the strip since K9). Admittedly her appearance is only fleeting and she only appears as an illusion to trick the Doctor and Frobisher but it does pave the way for future appearances as a regular character. The final full story of the year was a 4-part tale with each part given an individual title: 'Kane's Story', 'Abel's Story', 'The Warrior's Story' and 'Frobisher's Story'. The story (or stories, depending on how you look at it) sees the a group of six being recruited to save the galaxy from the evil invading Skeletoids.The Doctor, Frobisher and Peri (who the Doctor picks up from Earth) are three members of this group. The other three team members are scientist Professor Kane, Abel Ganz who is an expert in alchemy and has the power turn his body into any element and the Draconian Kaon whom the Doctor and Frobisher met in 'War-Game'. The Kaon they meet here though is a younger version of the person they met previously, such is the way with time-travel. The final strip of the year was called 'Exodus'. It was the first part of the 3-part story and this opening part acts as a prologue of sorts to the main story. It sees the Doctor and his friends assisting a group of refugees from an alien world. At the end of the strip, the Doctor decides to travel to the refugees' home world to investigate the situation there.